Staff and volunteers from Dial West Cheshire were joined by officers from Cheshire West and Chester Council for a great day of training delivered by Skills for People. 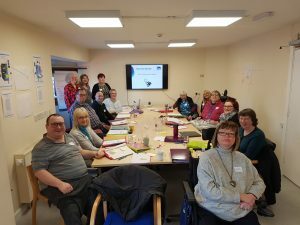 The training is linked to developing Dial’s Experts by Experience, people with personal experience of health and social care services for people with learning disabilities and/or autism. Our Experts by Experience will work with the Council to monitor the quality of services by undertaking visits and completing reviews of supported living schemes and day centres. If you would like to join our team as a Quality Monitor volunteer, or for more information, please contact us. ← Tight Controls on Chester City Centre “A-boards” to Continue.